Is the RGB from SCART meant to look better than the standard composite cables? Is it the official Scart RGB GC cable? The DOL-013(EUR)? If it's a third party cable it might not be RGB, but a composite or S-Video cable with a scart connector. With RGB scart you are only going to get 480i though, no 480p. PAL RGB from gamecube is 480/576i only. The picture from RGB should be higher quality than composite but if the OSSC is doing the work them you will get jitter. It won't match up well to native 480p through component/hdmi though. Try setting it to passthrough and see how your TV handles the deinterlacing, might produce higher looking results (at the cost of some lag). I didn't even know there was an official SCART cable made! Mine is from RetroGamingCables in the UK, which is fairly great quality, no? I think I have upsample2x enabled as well. My video looks a bit like your picture, which is to say not great. With my other native RGB systems (SNES, Genesis, etc) I see a marked improvement with the SCART cable over the standard composite. I can't quantify, but everything just looks better. With the Gamecube, it looks similar. Maybe I was hoping for a better visual improvement that just won't happen? With my other native RGB systems (SNES, Genesis, etc) I see a marked improvement with the SCART cable over the standard composite. I can't quantify, but everything just looks better. With the Gamecube, it looks similar. Maybe I was hoping for a better visual improvement that just won't happen? I also have one from RGC and I would say it's decent, but not great. There is quite a lot of composite video coupling causing diagonal interference, especially on solid colours. It is even more pronounced when running GBA games in 240p (GameBoy Player with GBI) as large sections of solid colours is more common in those kind of games. Note that composite video line has to be used for sync on PAL Gamecube. I have been toying with the idea of opening up the cable and separate the composite video line to the outside of the main trunk and perhaps put some extra shielding on it, but I never got around to it so far. The other alternative is to get the pack-a-punch version of the cable, which is much more expensive, but where each line is fully shielded. Lastly, you could put a sync-stripper at the console end of the cable, but that whole thing just seems to introduce more problems than it solves, so I won't be attempting that anytime soon. In the end, the picture is not super-stellar, but from my viewing distance it's still pretty great in my opinion. I run 480i/576i in passthrough mode (fortunately my TV does a good job deinterlacing) and 240p (GBI) in 4x optimized. I didn't even know there was an official SCART cable made! Ineed, only released in Europe, much like the Wii SCART cable, RVL-013. Mine is from RetroGamingCables in the UK, which is fairly great quality, no? I think I have upsample2x enabled as well. My video looks a bit like your picture, which is to say not great. Maybe I was hoping for a better visual improvement that just won't happen? Do you have a CRT? Maybe try hooking composite with the GC and then RGB and see if you see a difference. If the cable works as it should and is outputting RGB, you should definitly be seeing a difference. That's exactly what I was experiencing with the original Nintendo RGB Scart cable, with my PAL GameCube: terrible diagonal interference, even visible through OSSC's scanlines. 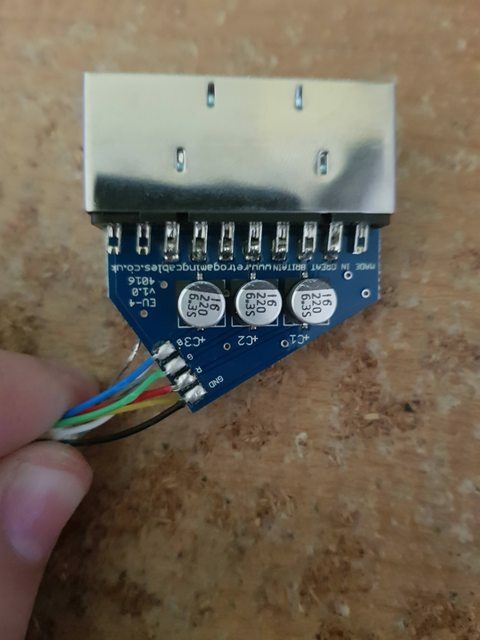 I found out the 'Nintendo GameCube GC RGB SCART (PAL) wired for composite sync CSYNC' from RGC - not the Packapunch model, yet not the cheapest one available either - cleaned things up massively. I still have to test GBI, but with GC games the results have been quite dramatic. I went with the lowest price cable because it's what matched best the recommendation on RetroRGB. What are these diagonal lines you all speak of? Is it moving static or something else? Anyone have a picture? I pushed current version of zero-riscy integration project into github with an example in case any developer is interested testing that core in a simple environment. Actual integration in OSSC project will still take a while as it includes Altera IP of which drivers need to be adapted / rewritten. Meanwhile, everyone are free to check the first version of OSSC display test suite firmware (incl. 10 tests) which was just recently completed. Very cool, I’m sure the video tests will come in handy for many people! Also great for troubleshooting as it can be used to confirm or rule out certain things (ie what is a display issue vs console/cabling issue). First of all, this test firmware is absolutely amazing! It will make all of our lives so much easier. With that said, can you change the 60.5 Hz test to match the output of the NES and SNES? I had a television recently that would handle 60.5Hz fine, but failed to properly display NES and SNES. I propose that a slightly faster refresh test would provide a better "real world" benefit. Edit: Disregard my question entirely. I was reading 60.05Hz and it clearly says 60.5Hz. I'm quite embarrassed.. It is a very useful feature and it works great. On typical TN panel PC monitor everything is butter smooth, although not the best colors or gamma tracing. Though once there is an image on screen from one of the inputs I can't go back to the test patterns nor force the test patterns to appear. 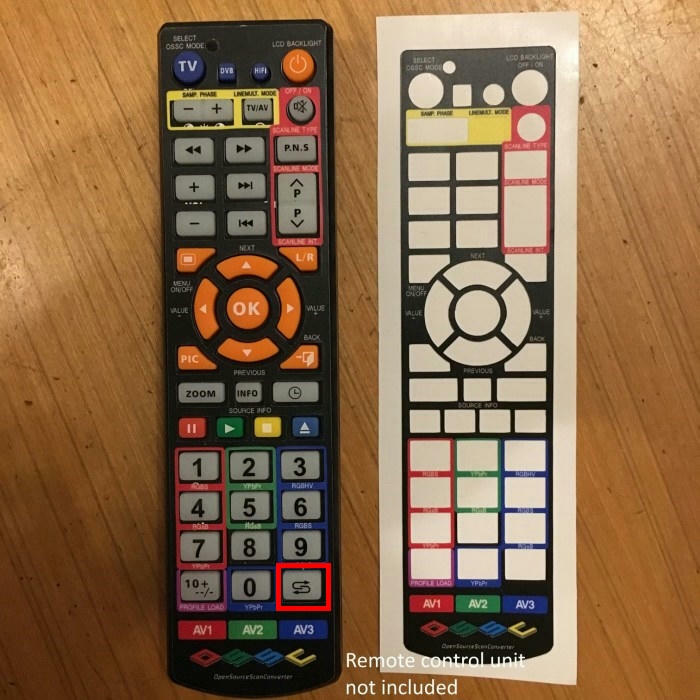 It would be very handy to have the test pattern on a remote control key to prevent the monitor from turning off when there is no input signal and/or call the test pattern at any time. The button marked in red is free and right next to the inputs, ready to be the "test pattern" button. It's great to see that the pulpino OS development is slowly but surely materializing, best of luck! I did another side by side and I do think the SCART looks sharper. So maybe my cable is fine enough for the console. Is there a setting for the color though, or is that another cable issue? My yellows are blue and blues are red (I think?). See the picture I took directly from NGC to OSSC. Looks like they swapped the video lines around, but seems weird that could make it past QA. If it's the new version cable that has the circuitboard in the scart head you can resolder them easily. Or you ask RGC for a replacement. Unscrew the little cap near the end of the cable and pop it open to show us the inside (it should have interlocking plastic so you can put it back together afterwards). Anything that bad they should be replacing immediately, unless the problem is something else. You want to be looking at where the wires join the PCB at the bottom left. They are colour coded here, it might be the case that the coloured wires don't match the letter on the pad (red wire to B, etc.) and the person assembling the cable simply did it backwards on autopilot. It is also possible that the wire colours are wrong (linked to the wrong pins at the other end - you could check this with a multimeter). Either way seems pretty cut and dry to me that the B and R wires are swapped, this is a trivial fix if you have any soldering experience.. but if mistakes are made then you may end up voiding your warranty by doing this. If you have any doubts, contact RGC first. Yeah as others have said contact Retro Gaming Cables, there is something wrong with the cable if that's the colors you are getting through RGB when using the SCART cable. Thanks for the tips RE: NGC SCART; I'll take a look this evening. I contacted RGC regardless, as this is likely their fault. edit: Took apart my cable, visually all solder joints are sound. I didn't bother putting a multimeter to the pins something is just off here. If I wanted to order a proper cable from Retro-Access, which works with a PAL NGC? Standard or CSync? This is interesting and probably accounts for why certain output signals from the OSSC enable/disable certain picture modes on my OLED display. Specifically, the display removes entirely a picture mode when it receives 4x 480i signals from the PS2 and Wii (with a few random times the Wii signal being detected in a way that enables all picture modes, like 3x 240p does). 480i 2x does enable all picture modes, but it doesn't look as good as 4x. Another reason why control of how the display detects the signal in my setup would be to make use of the all-direction-zoom function on the display, which works great for 240p signals since the display zooms it starting from the correct 4:3 aspect ratio, whereas 480i signals are stretched as if they were 16:9, even though in "original" AR they are indeed displayed as 4:3. Does your display support 4x (bob) for 480i? That may look better but IMO you need scanlines at 100% for it to look clean and sharp. In this way the image can look remarkably similar to how it looks on my BVM. But 2x should look basically just as good. 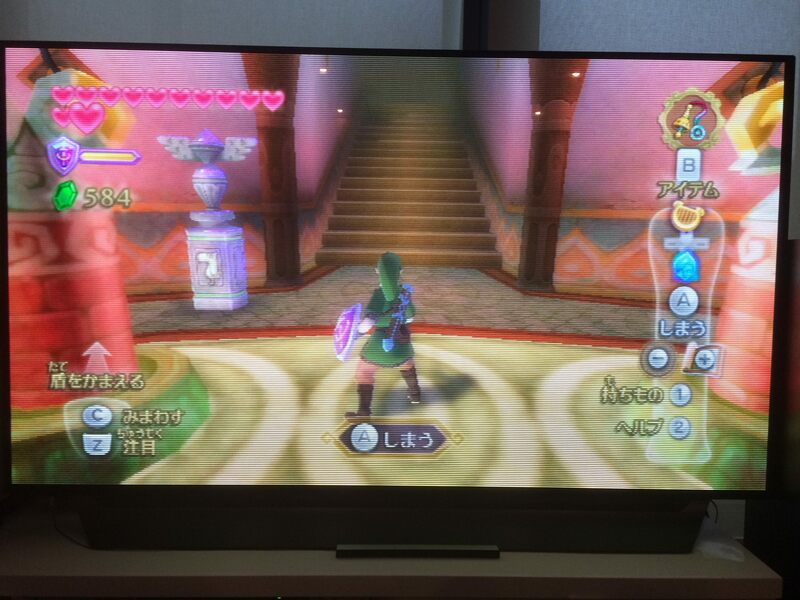 Here are two pictures of the Wii on 2x and 4x bob with 100% scanlines. You can see scanlines in the pictures but of course they are flickering, and from viewing distance the flicker is almost unnoticeable. PS2 480i looks just as good. The Wii is hooked up with a good quality SCART cable, but I'd imagine you'll get the same results with component as long as you set the Wii settings for SDTV 480i 60hz rather than EDTV 480p. 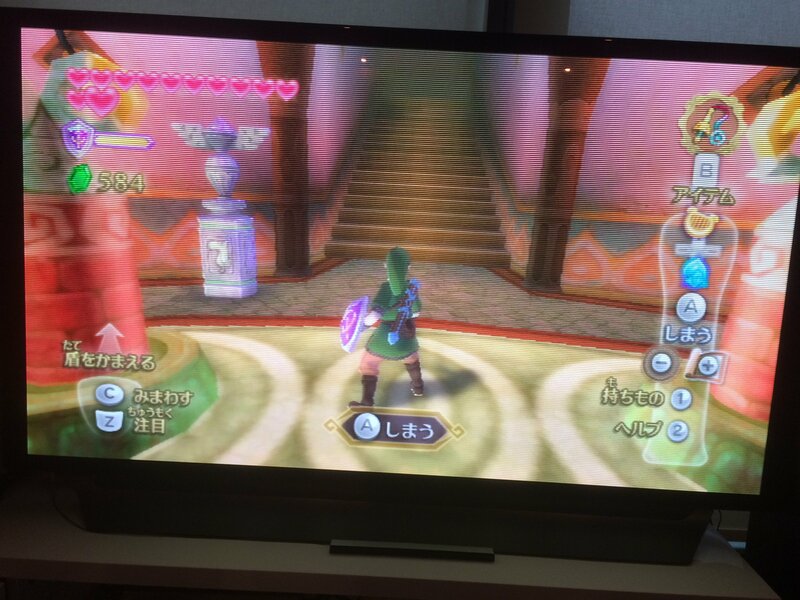 I honestly think 480i 2x or 4x in this way looks much better than 480p 2x for these 3D games. Last edited by fernan1234 on Mon Sep 24, 2018 12:36 am, edited 1 time in total. Speaking of 480i Line4x (bob) and horizontal scanlines: on my monitors, they all seem to auto-set to alternate, and the result... Well, I don't especially like it. Is it due to displays' limitations or are they supposed to look like that, in line-quadruple? If it was possible to combine the sharper output of L4x with the stable, non-flickering, scanlines from 480i (bob) line-doubled, it would be ideal, at least for my personal tastes. I would like to see digital inputs for future versions of the OSSC, like HDMI or DVI. So far the best is VGA but that's still Analog. About 100 pages ago, there was some testing with something call VP50PRO. It allows to add "negative edge enhancement" and "detail enhancement" to the OSSC output signal for a CRT (a sharp CRT) look. I now use only generic 3:4 (5x 1200p with scanlines), I tried optim mode for a couple of month but it looks too blocky to me. Is there an equivalent option on the OSSC that is similar to those "negative edge enhancement" and "detail enhancement" options?? Not quite sure what you’re after, but for a softer look, i’d go for x4 mode with scanlines. I had to enable DTV-480p on my OSSC else the Dreamcast image would drop consistently. I didn't have to enable anything, but that's because I connect my Toro with a SCART cable instead of a VGA cable, and DTV 480p is on by default on AV1 and AV2. Auto just means that it will assume any signal that comes in over RGBHV (which is only possible on AV3) needs VGA 640x480, and anything else is assumed DTV 480p; so it shouldn't need to be changed unless you're trying to connect RGBHV from your Dreamcast to AV3.